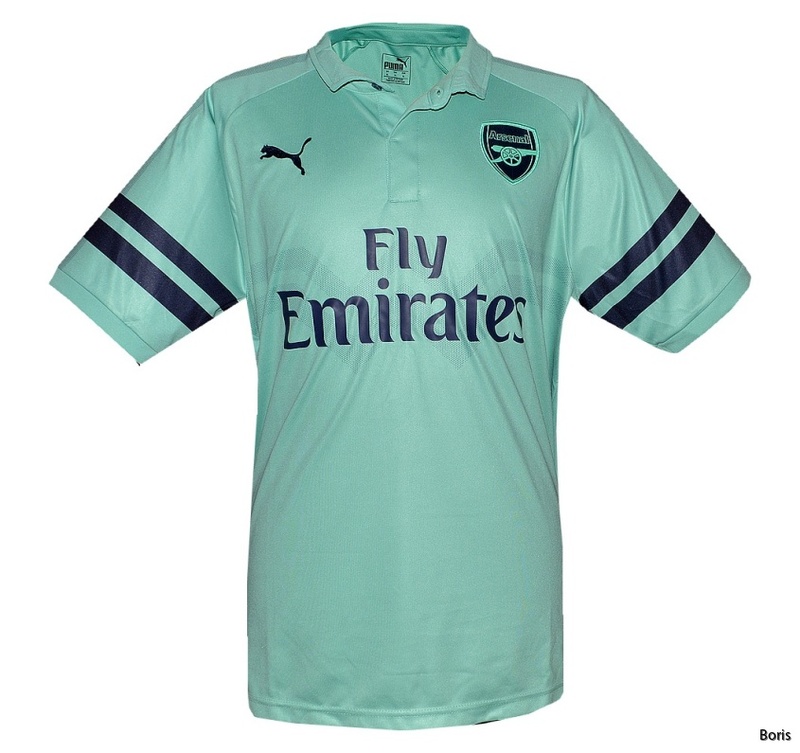 Arsenal were originally formed as Dial Square FC in 1886 by workers at the Woolwich armaments factory in South London, a connection immortalised in the club crest, adopted in 1888, featuring three cannons (which never appeared on players' shirts). The name was changed to the more imposing Royal Arsenal a few months after their formation. It has been widely reported that the club were given a set of Garibaldi Red shirts by Nottingham Forest but research by Mark Andrews and Andy Kelly has cast doubt on this. One of Arsenal's founders was Fred Beardsley, a native of Nottingham who was, according to his obituary had the idea of adopting Forest's colours. As an amateur, Beardsley continued to turn out for Forest in cup games and this may have given rise to the apocryphal story. In an interview published in 1938, Beardsley described the team's first strip as "red shirts, white three-quarter master pants, black stockings and caps." He also mentioned that Forest donated Arsenal's first football. Having turned professional in 1891, the club found themselves ostracised by their amateur peers (association football in the metropolitan area was still dominated by gentlemen-players from the upper classes) and expelled from the London FA. Their initial attempts to form a professional league foundered (it would be another two years before the Southern League was formed) so, after a gruelling 1892-93 season of friendly matches against teams (including Football League sides) from the north, midlands and Scotland they applied to join the Football League. To this end the club became a limited company in 1893 and were required to drop "Royal" from their title. 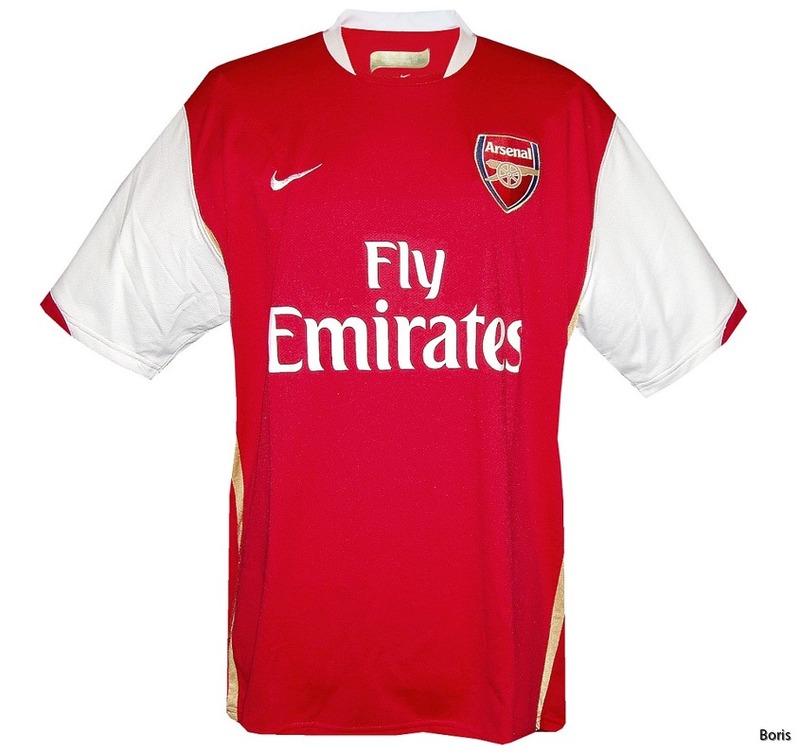 As Woolwich Arsenal, their application was successful and they became the first club from south of Birmingham to play in the Football League. According to the Official History, the team experimented with red and blue striped shirts for the 1895-96 season and photographs of two key players, Harry Storer and Caesar Jenkyns appear to show these tops. In his extensive research, however, Mark Andrews found no contemporary press reports of the team wearing stripes and all the team photographs of the period show the regular, plain tops. We have now concluded that the Official History is incorrect on this point and that the surviving photographs show shirts worn in 1892 when the team changed for a game with Nottingham Forest. 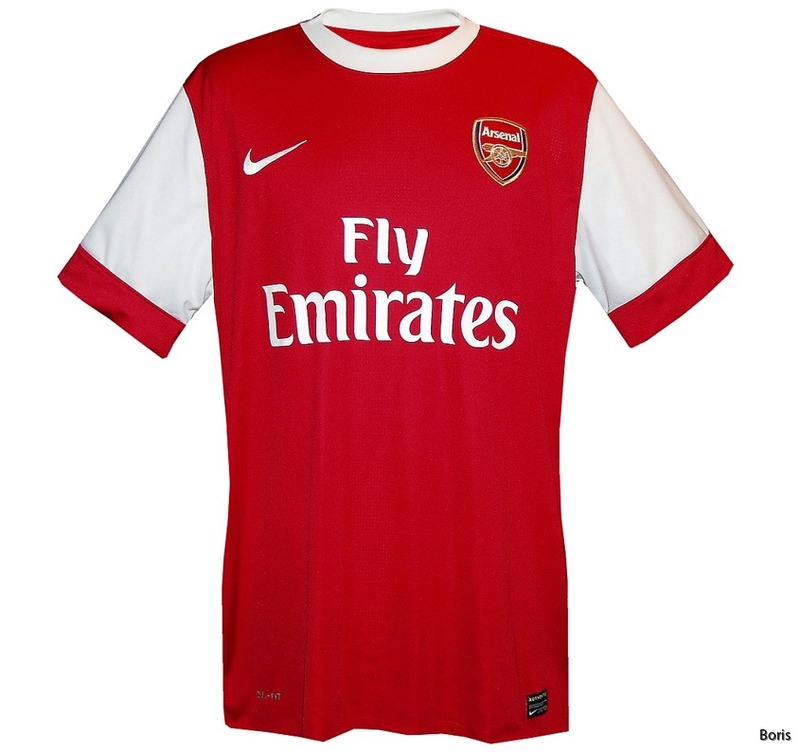 Arsenal won promotion to the First Division in 1904 and survived for nine years until they were relegated 1913. That year the club left Plumstead in south-east London to move to Highbury despite vigorous protests from Tottenham Hotspur. When League football resumed after the First World War in 1919 the First Division was expanded. Arsenal's chairman, Sir Henry Norris, contrived to have his club (who had finished fifth in Division Two in 1915) replace Tottenham [arsenal crest 1927] (bottom of Division One). After several mediocre seasons, Arsenal appointed Herbert Chapman as manager. Having previously guided Huddersfield Town to two of their three successive League titles, Chapman set about transforming Arsenal from an average First Division club into one of the great names in world football. 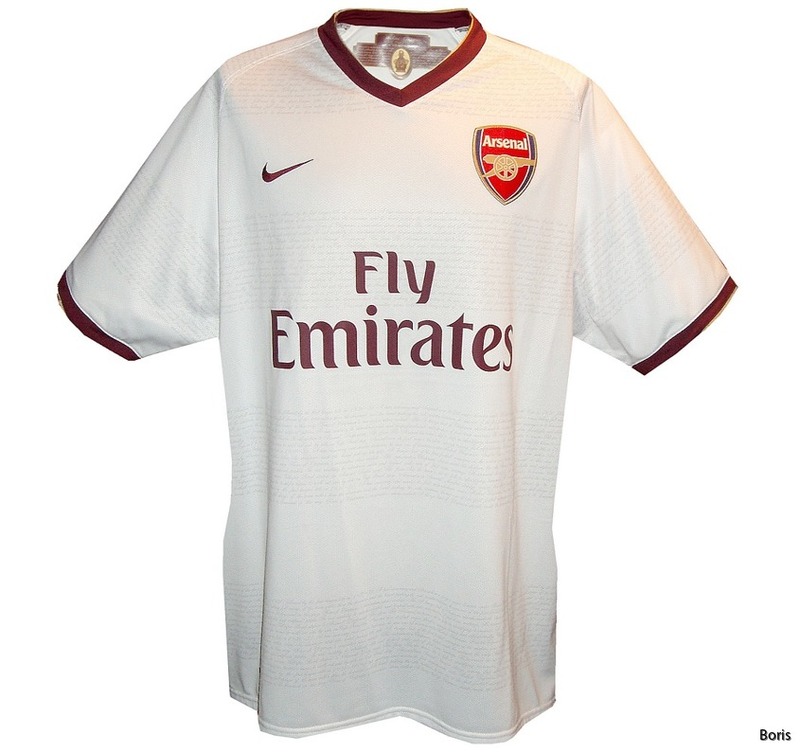 He had the nearby underground station renamed "Arsenal", pioneered the use of shirt numbers and introduced the now famous white sleeves. 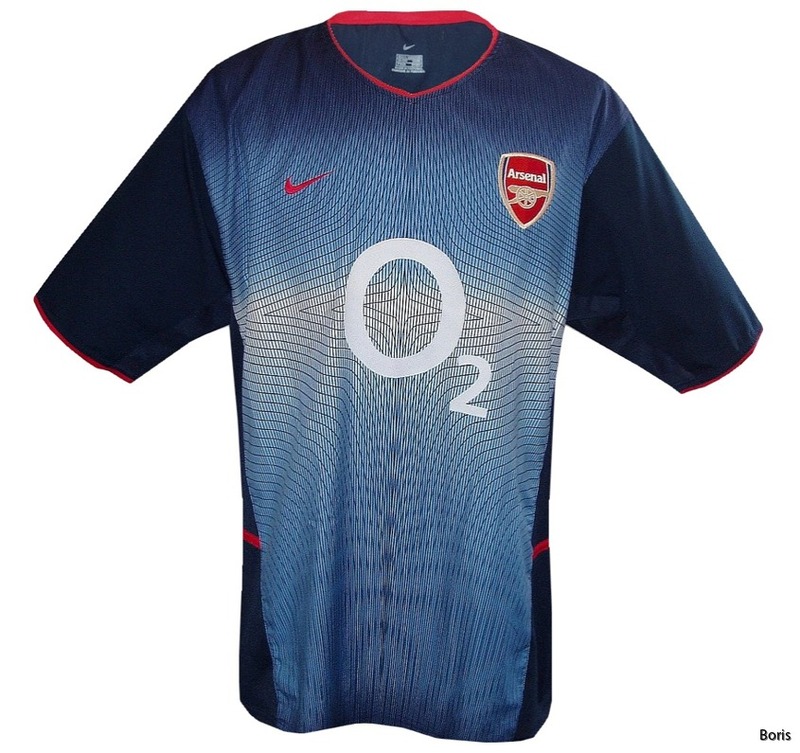 Andrews and Kelly have discovered that the first version of this iconic kit consisted of white cricket shirts (their change kit at the time) worn with thin, red sleeveless pullovers. This outfit proved troublesome to wash so conventional and flannel shirts were introduced, probably at the start of the 1933-34 season. 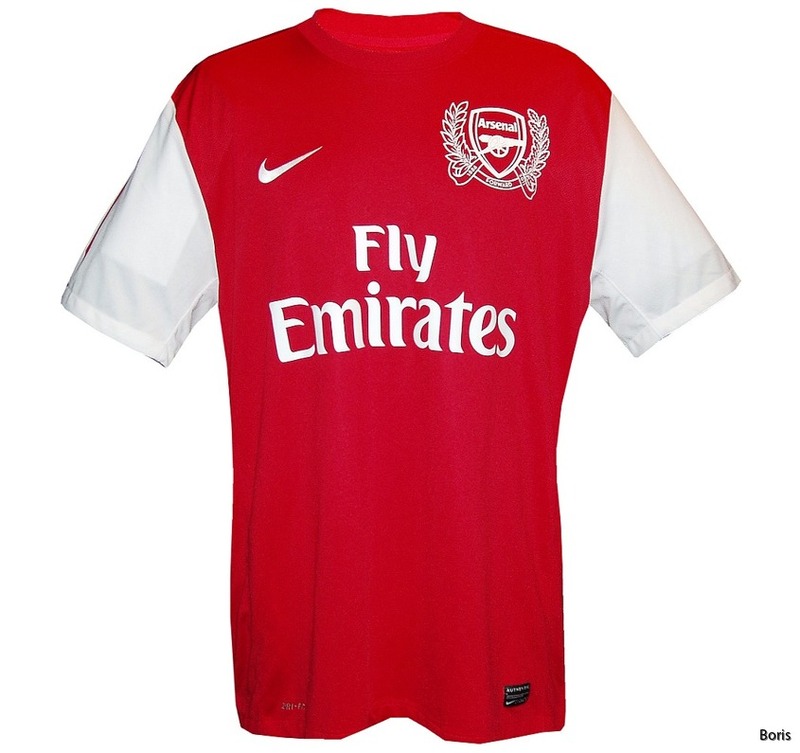 Under Chapman's guidance the club went on to dominate English football over the [arsenal crest 1930] following decade. Although crests were not worn in league games, they did appear in FA Cup finals, the first being a monogram in 1927 followed, in 1930, by a version with a cannon. [arsenal crest 1932] The FA Cup became Arsenal's first major trophy in 1930 and their first League Championship in 1931 was followed by a further four titles and another FA Cup over the next seven years. A new art deco crest was designed and appeared on the shirts worn in the 1932 FA Cup Final and other pre-war finals. A slightly different version appeared prominently in the club's fabled marbled halls, over the East Stand and in the boardroom. After the interruption caused by the Second World War, Tom Whittaker forged another [arsenal 1950 fa cup final crest] great team winning two more titles (1948 and 1953) and an FA Cup (1950) with the 1951-52 season also seeing the Gunners narrowly miss the elusive double, runners up in both league and FA Cup. The crest worn in the 1950 and 1952 finals was slightly different to the pre-war version. Whittaker's death in 1956 presaged a barren 14 years. 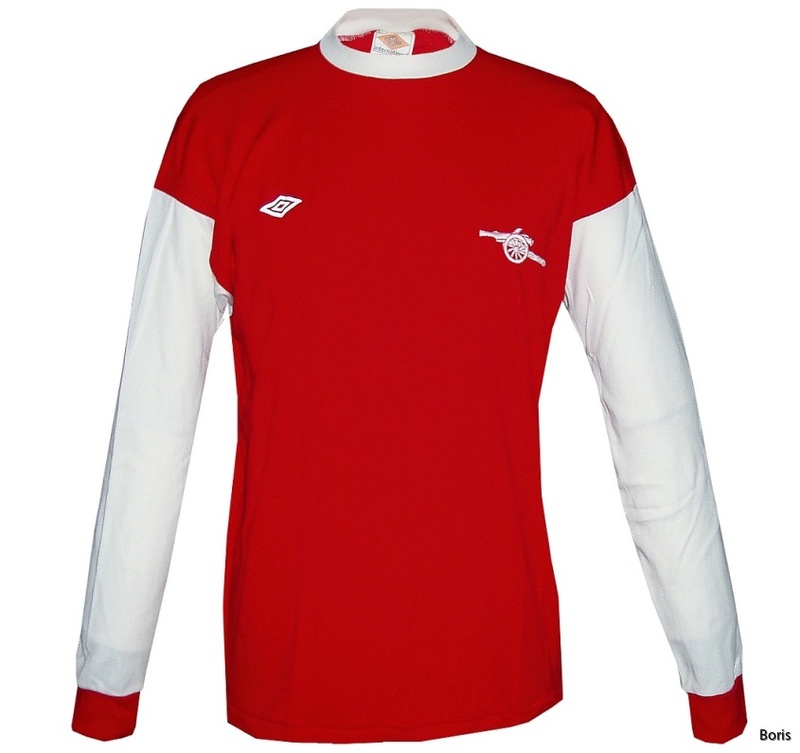 Around 1957 Arsenal adopted the modern continental style shirts but the older style, with buttoned collars and long sleeves occasionaly appeared until at least 1962 in cold weather. [arsenal crest 1967] Club physiotherapist Bertie Mee took over as manager in 1966 and in 1967, after two seasons wearing plain red shirts, the classic Gunners' strip was reintroduced, now enhanced by a smart new crest consisting of a cannon. Defeat in the League Cup final of 1969 at the hands of Third Division Swindon did not bode well but a year later Arsenal captured their first European trophy, winning the Inter-City Fairs Cup against Anderlecht. The following season Arsenal achieved the domestic "double," clinching the League championship with a 1-0 win over Tottenham. Days later a Charlie George goal won the FA cup in extra time at Wembley against Liverpool. [arsenal crest 1978] Despite reaching the FA Cup final again in 1972 and finishing second in the league the following season Arsenal became a mediocre side during the mid seventies. Towards the end of the decade Terry Neill and Don Howe achieved some success when Arsenal reached the FA Cup final in 3 successive seasons. 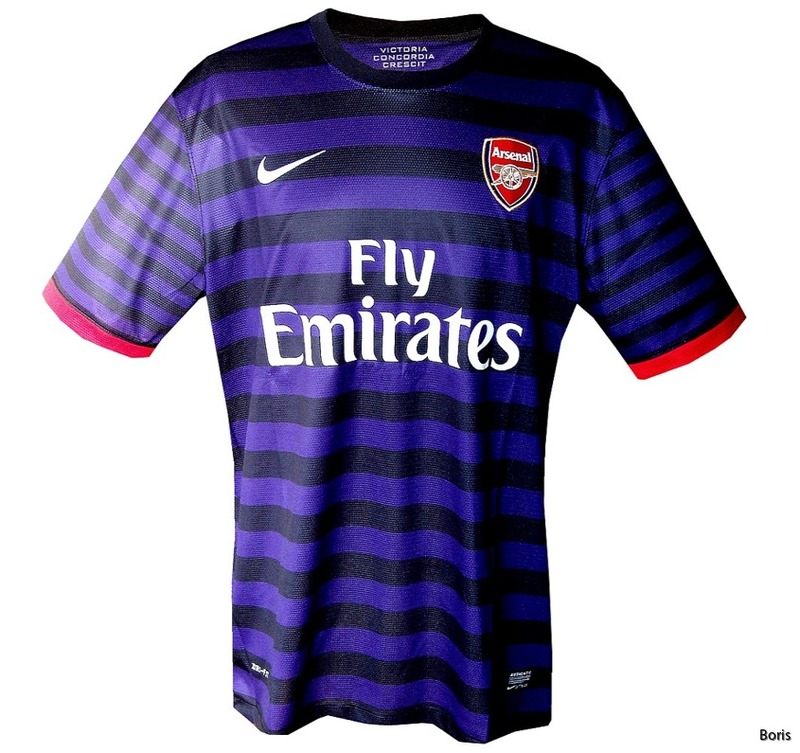 This coincided with a slight modification to the crest, which now had "AFC" superimposed on three, stacked cannonballs, a motif now repeated on the shorts. Only the middle visit to Wembley, in [arsenal crest 1985 centenary crest] 1979, was triumphant, a thrilling last minute 3-2 victory against Manchester United. 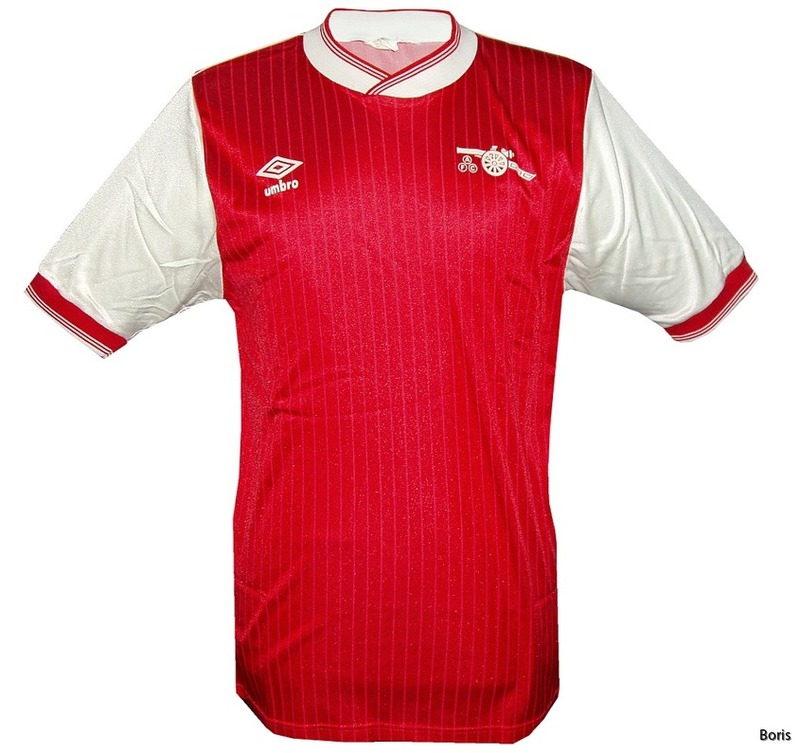 The following season saw cup heartbreak when Arsenal lost the FA Cup final to West Ham, and 4 days later the European Cup Winners Cup final to Valencia on penalties. In the 1985-86 season the legend "Centenary Year 1985" was added to the crest. 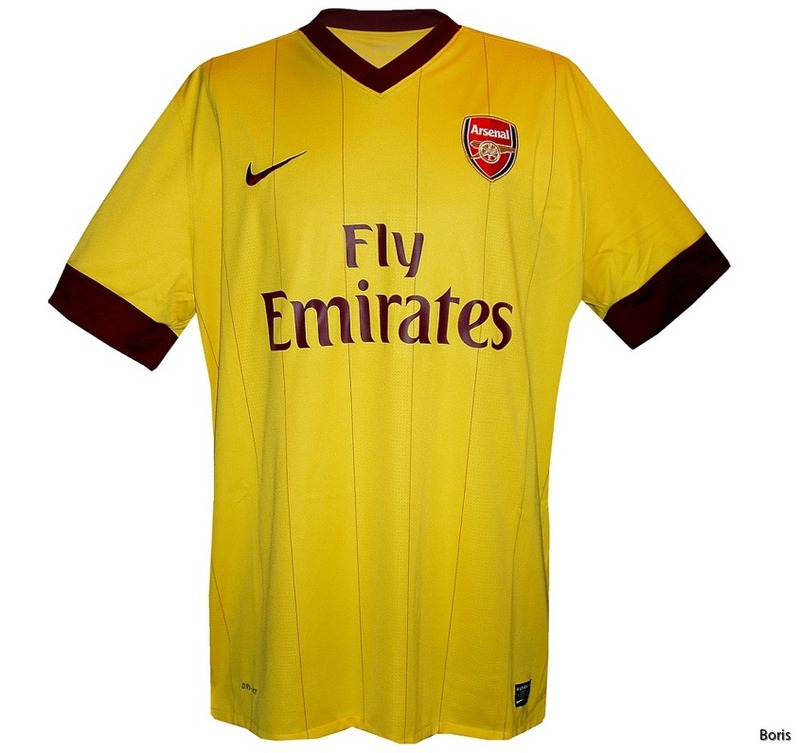 After George Graham took over in 1986, Arsenal won six major trophies in the next eight years. 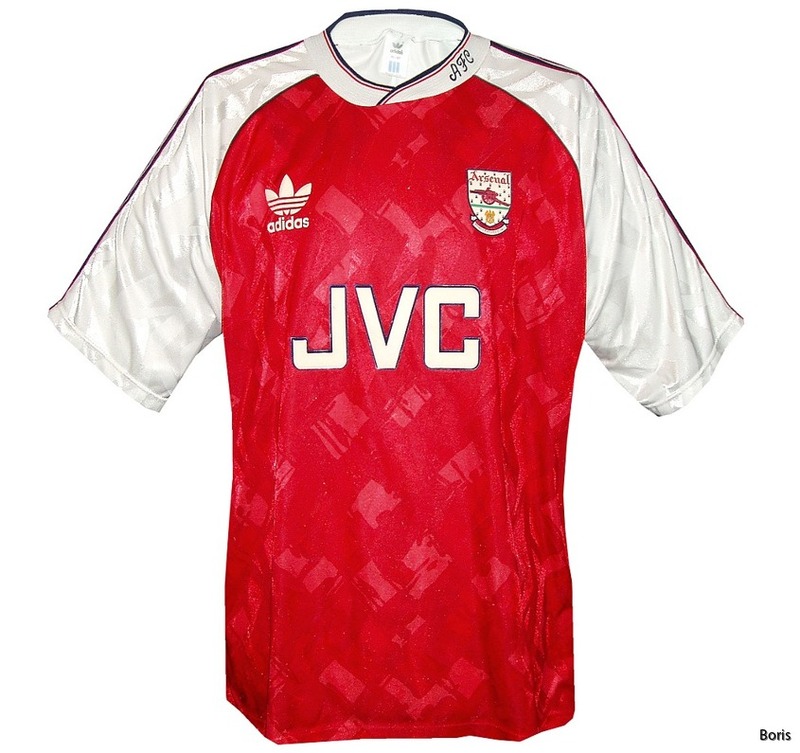 A League Cup triumph in 1987 was built upon, and in 1989 the League Championship returned to Highbury after an 18 year absence when Arsenal pipped Liverpool to the title on [arsenal crest 1990] goals scored. In the most exciting finish to the league season ever witnessed in English football the final, deciding match at Anfield was won 2-0, the decisive second goal coming in injury time. Another championship followed two years later when Arsenal lost only one league game and conceded just 18 goals in 38 matches. 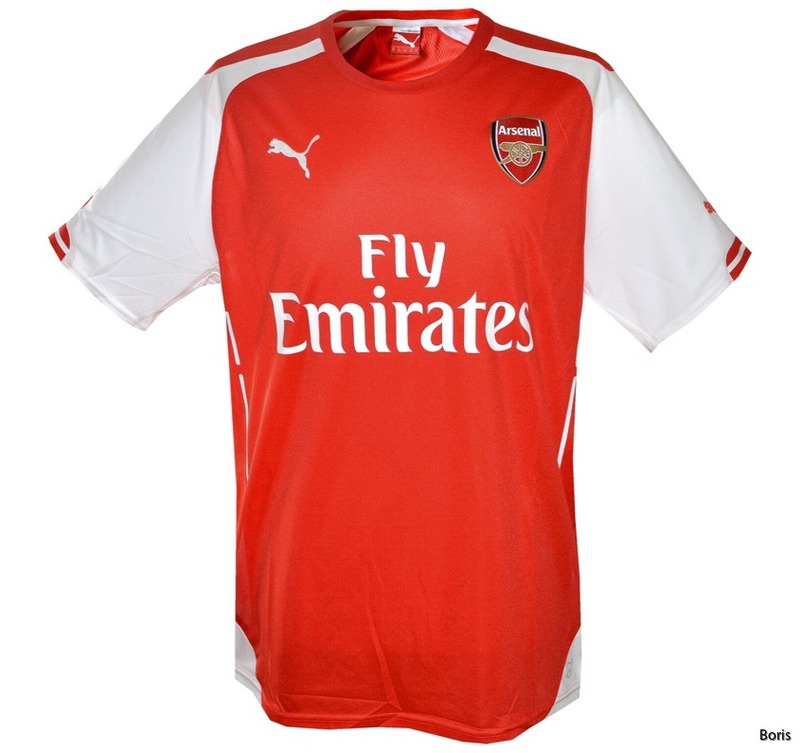 In 1990 the club adopted the crest first designed in 1949 and now worn on the pitch for the first time. 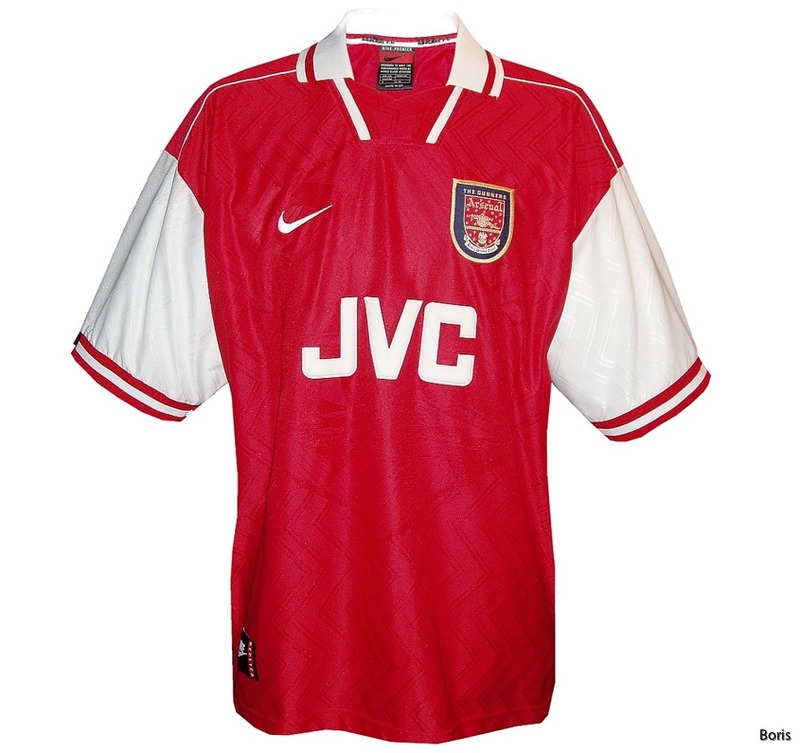 [arsenal crest 1994] In the Premiership's inaugural year 1992-93 Arsenal became the first team ever to win both domestic cups in the same season. The following year the European Cup Winners' Cup was won in Copenhagen. 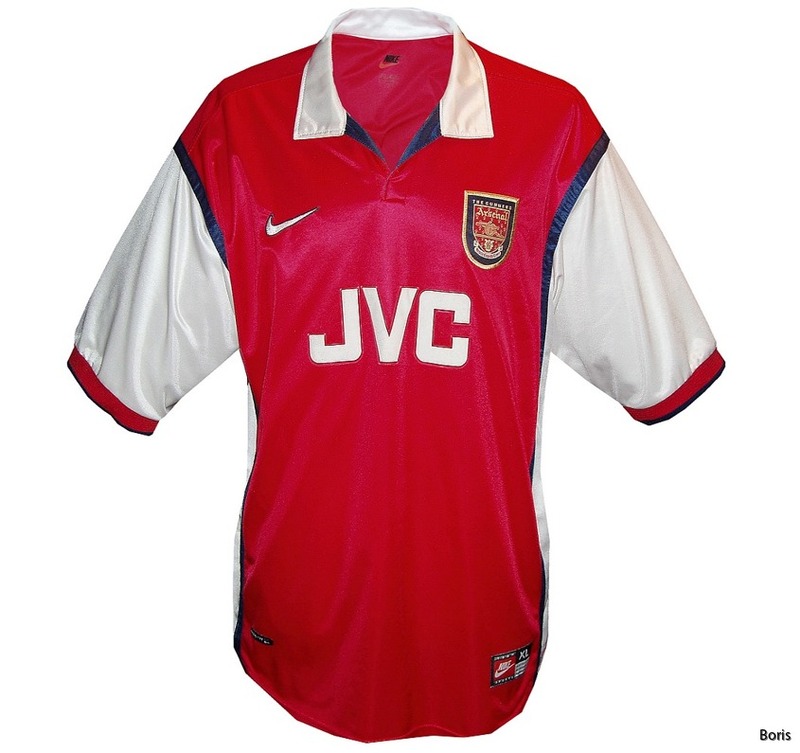 Despite the cup successes, Arsenal's league results remained ordinary and following a scandal over illicit transfer payments, Graham was sacked in the middle of the 1994-95 season. 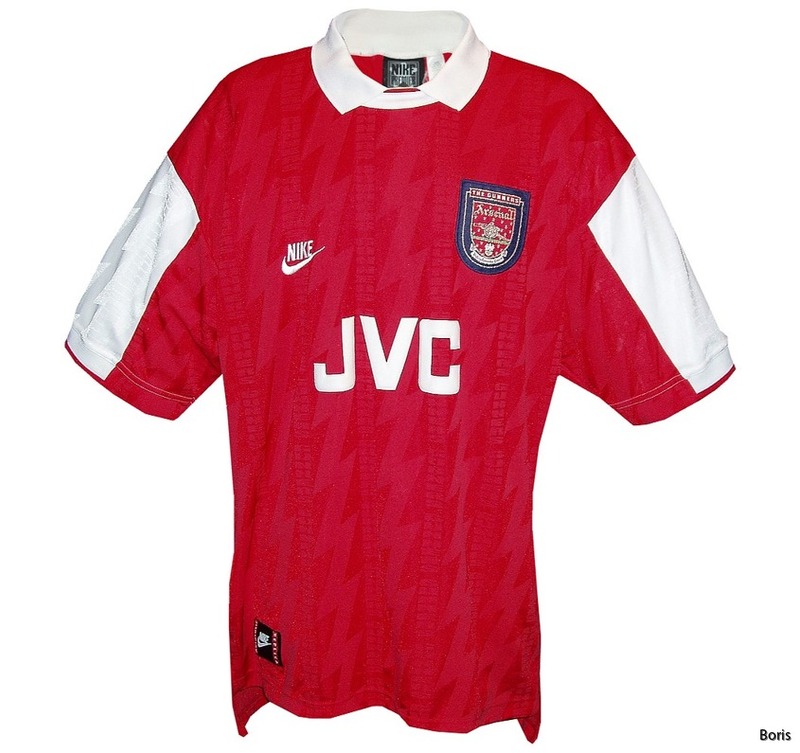 Also in 1994, the crest was altered to more subtle colouring which, [arsenal crest 1995] with slight modifications in 1995 and 1998, appeared on a navy shield until 2000. After a period of turbulence, Frenchman Arsene Wenger was confirmed as Arsenal's new manager at the end of September 1996. Wenger set about transforming Arsenal's traditional cautious playing style. 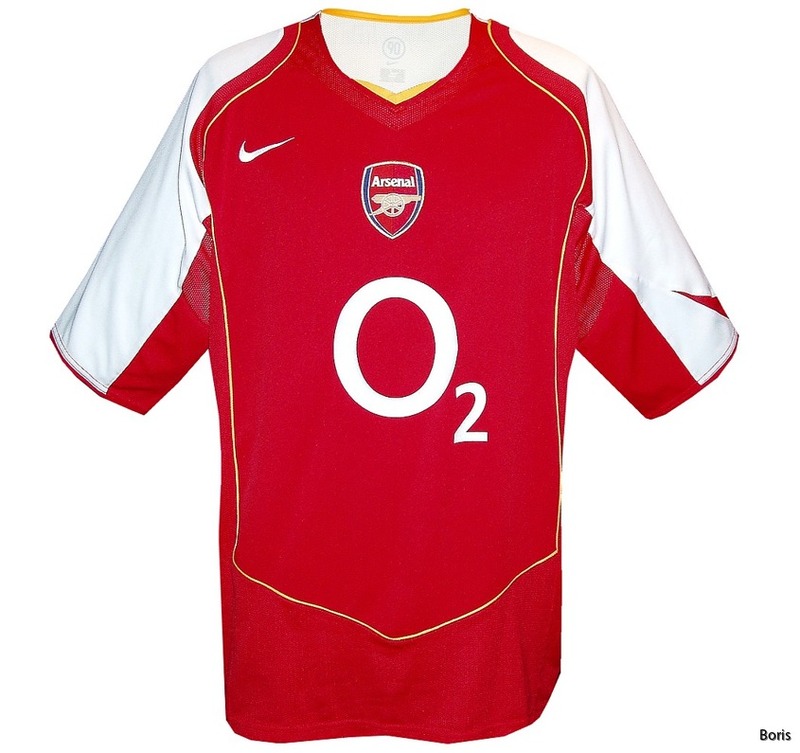 In 1998 Arsenal won the double [arsenal crest 1998] for the second time, eclipsing Manchester United after trailing them by 13 points in January. The second half of the double, the FA Cup, was achieved with a comfortable 2-0 win against Newcastle at Wembley in May. The following season Arsenal fell just short of repeating their triumph, losing unluckily in the FA Cup semi-final in extra time to Manchester United and missing out on the title to the same deadly rivals by just one point. As the new millennium approached, the balance of power between Sir Alex Ferguson's Manchester United and Wenger's Arsenal tipped towards the Londoners. 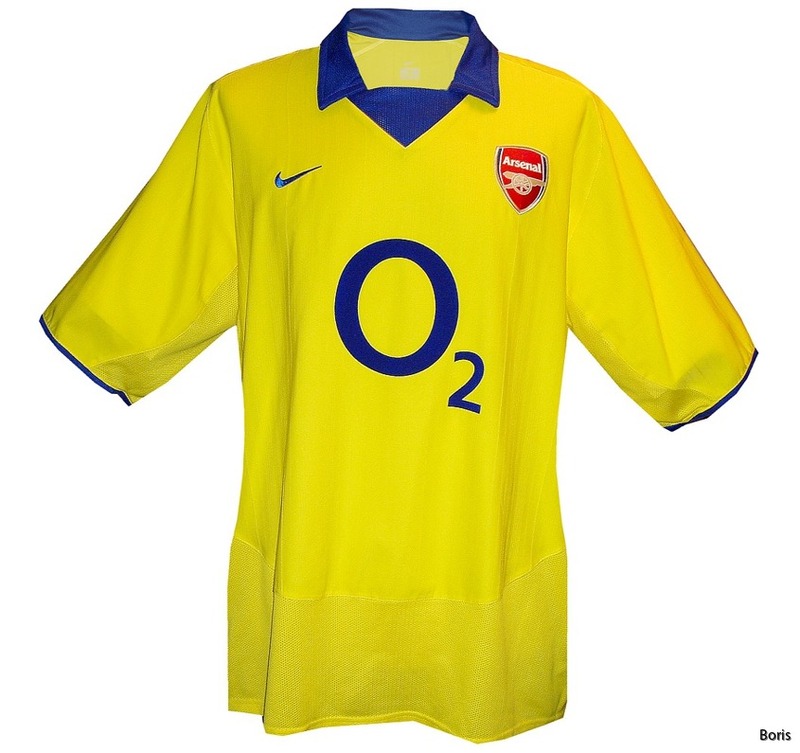 In 2001 the crest was modified again for commercial reasons with solid yellow replacing the gold tones and the club motto rendered in clearer script to make the whole image easier to reproduce but this version was not applied to the team's shirts. 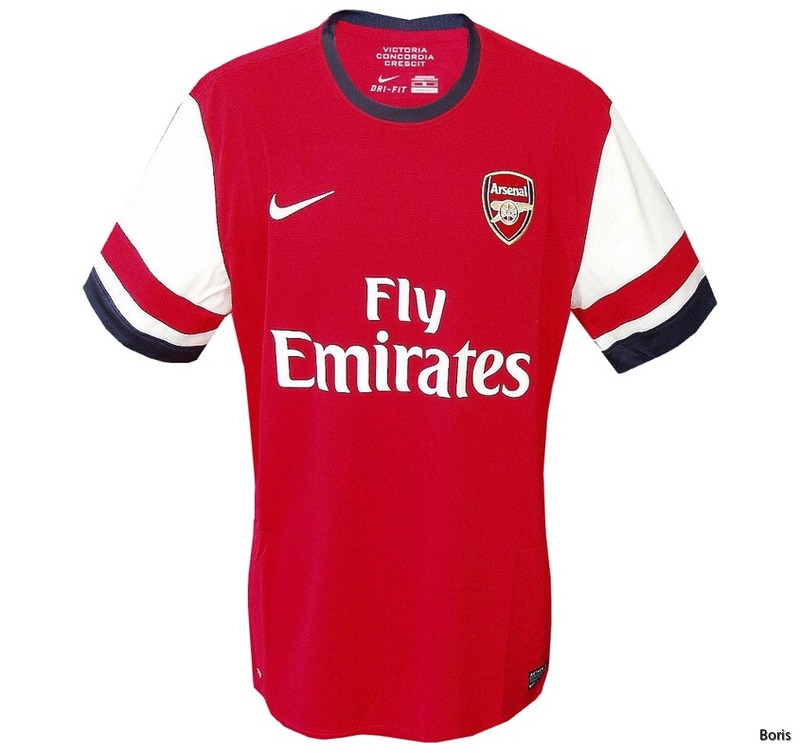 Because Arsenal's crest had evolved over many years, incorporating design elements from several sources, the club was unable to register copyright. 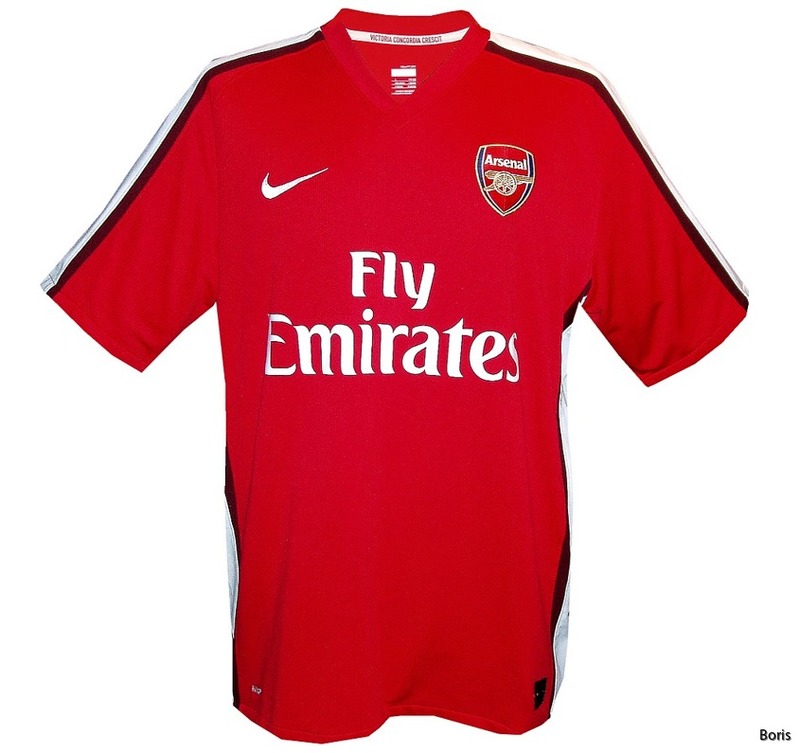 To overcome this and to [arsenal crest 2002] emphasise the renaissance of the club, a new crest was introduced in 2002, which combined Arsenal's traditional colours with metallic gold, all of which would be featured in Nike's kits over the following seasons. 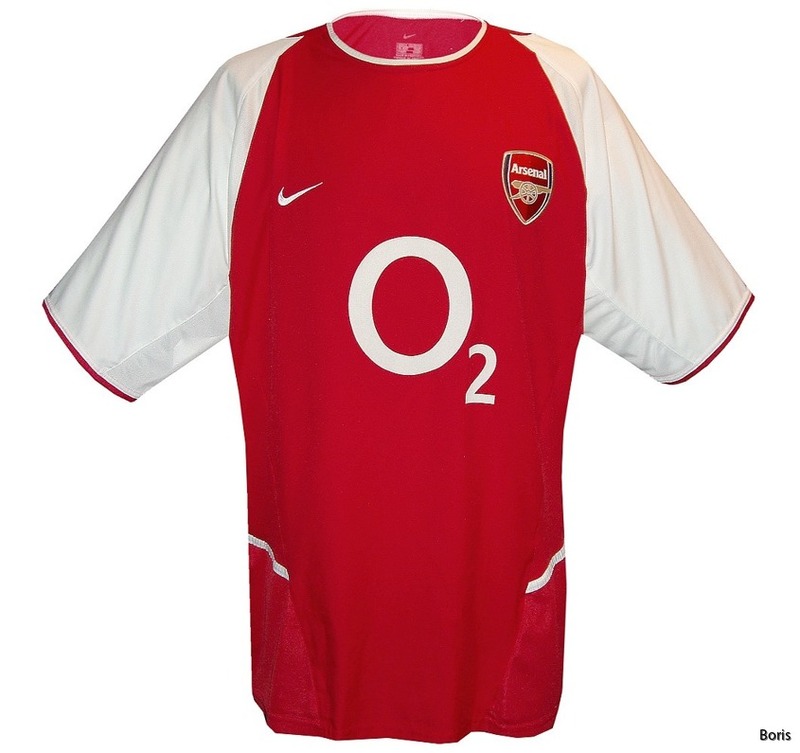 Another double was achieved in 2002 and in 2004, the Gunners won the Premiership title without being defeated, a feat that has not been achieved since Preston North End won the first ever League title in 1888, undefeated in 18 games. Arsenal were unbeaten in 38 League matches. A year later club won the FA Cup in a penalty shoot-out against Manchester United, the first time the competition had been decided in this way. 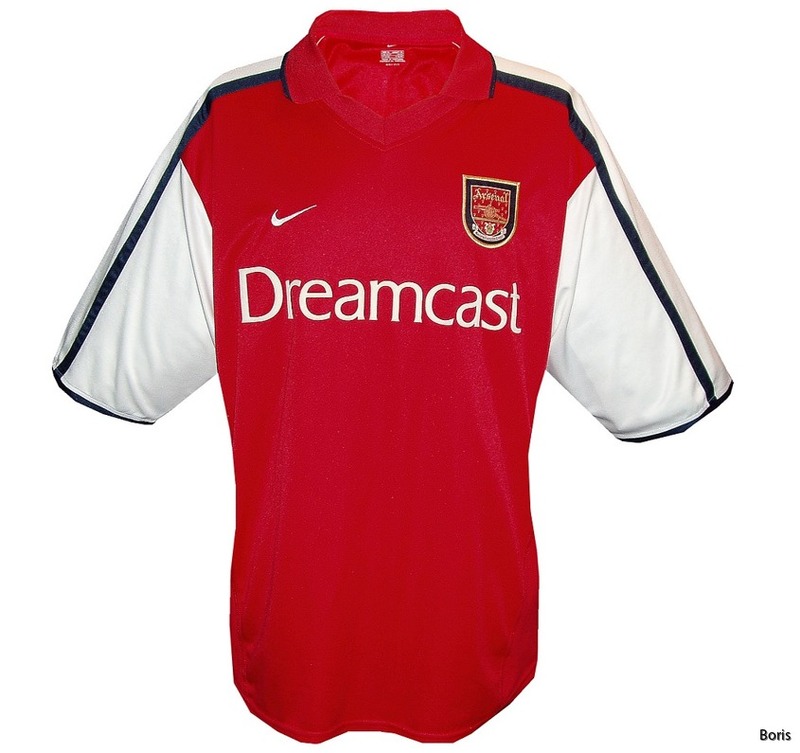 In June 2005 the club announced that they would play in dark "red currant" jerseys for one season to mark their last season at Highbury. 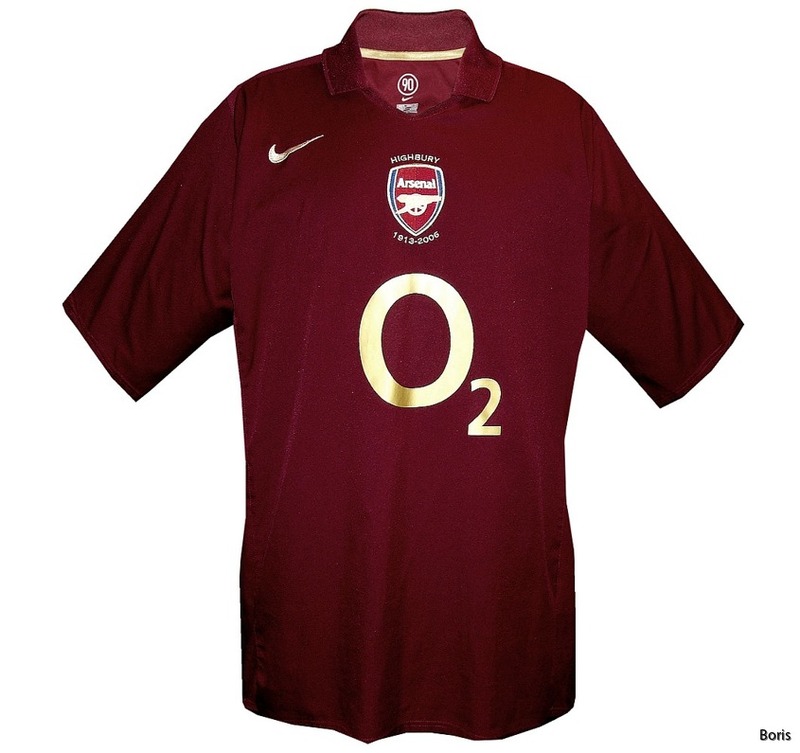 The marketing campaign asserted that the colour was based on the dark, plum coloured shirts worn when the team moved to north London, with a poorly colourised team photograph from the period in support. With help from Mark Andrews and others, HFK is now convinced that there is no truth in this story and the club has always worn bright red shirts. The dark appearance of their early tops is due to the photographic emulsions in use at the time, which were insensiteive to red light. 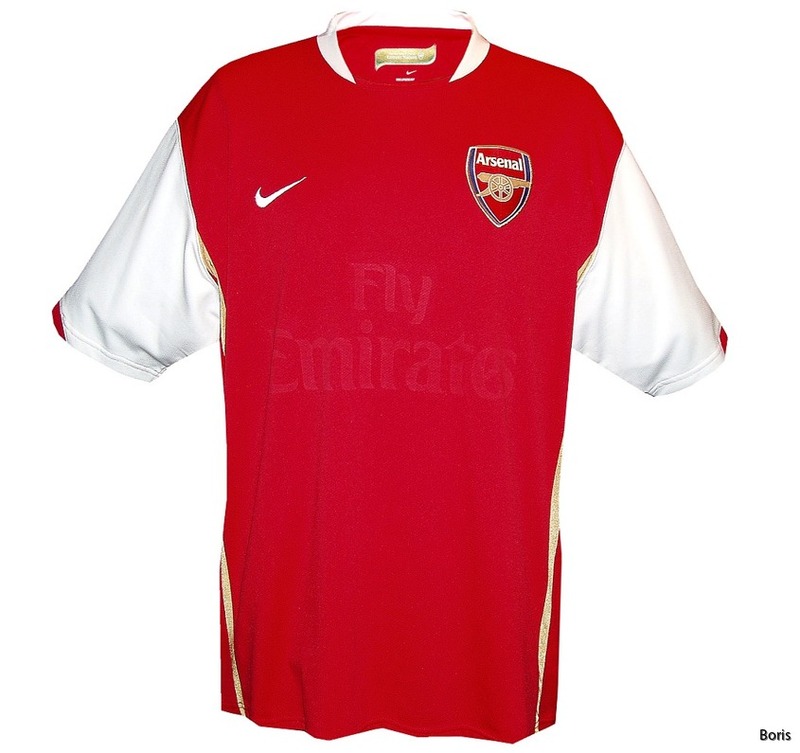 The following season a more traditional strip was introduced, restoring white sleeves (with metallic gold trim on the body) and in 2008, Nike took something of a risk by reintroducing [arsenal 125th anniversary crest] predominently red shirts with white and "red currant" trim. 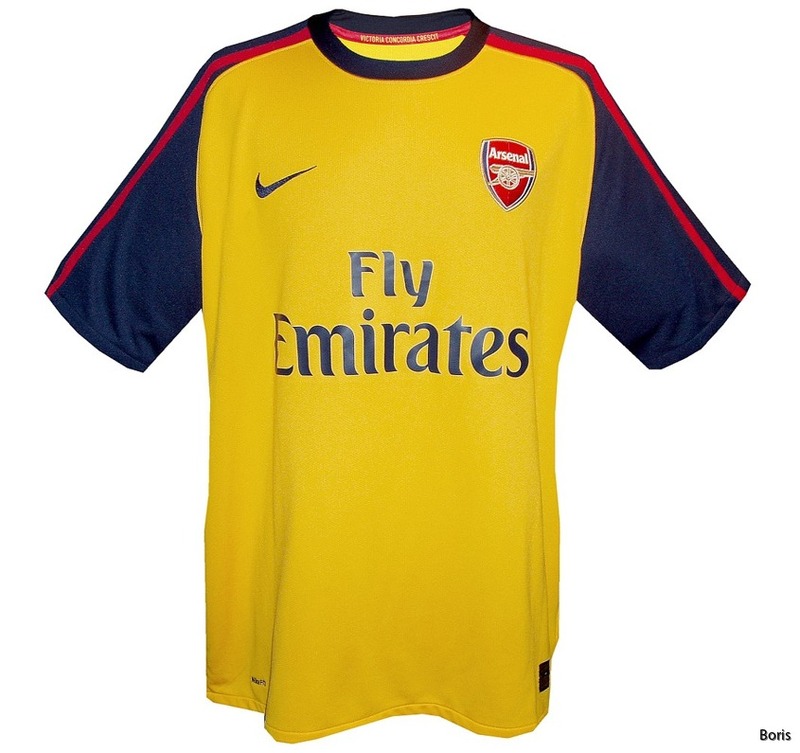 Nike's 2010 strip marked a popular return to tradition with a recreation of the iconic shirt from the Seventies, matched by a similarly bold but simple outfit for the club's 125th anniversary in 2011-12. For this occasion a special crest was introduced. This featured 15 oak leaves (representing the fifteen founders of the club who met in the Royal Oak public house), 15 laurel leaves (taken from the threepenny bits each paid to establish the club) and the club's first motto, "Forward."